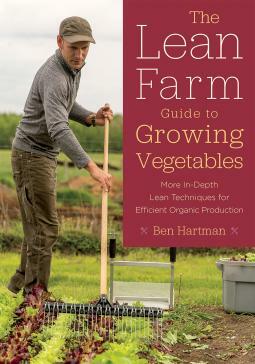 When I read Ben Hartman’s first book, The Lean Farm, and wrote my review in October 2015, I was on the path from curious and enthusiastic skeptic to enthusiastic-fan-with-reservations. I rejoiced in the ideas of reducing wasted effort, being more efficient, more successful at producing food, happier, less stressed. Ben Hartman, Jean-Martin Fortier and Curtis Stone are three successful commercial vegetable growers who clarified for me that a small-scale farm could be more efficient, more sustainable and certainly more pleasant if worked mostly with manual tools and a walk-behind tractor (rototiller) than with a ride-on cultivating tractor, which was the direction I had been looking in. We really didn’t want to be spending our time on a tractor, or under it, maintaining it. We didn’t want a class of tractor-driving gardeners divided from a class of hands-in-the-soil gardeners. Nor did we want to re-format our gardens and give up all the space to allow a tractor to turn around. By and large I valued the actual techniques and strategies. I bristled against his classifying planning, organizing and other managerial tasks, as well as bed prep, hoeing, weeding, thinning seedlings as type 1waste (muda, in Japanese). That just didn’t sit right with me. Perhaps it’s a word that doesn’t translate well. A commenter on my blog clarified this for me. She likened type 1 waste to Stephen Covey’s Quadrant 2 (Important but Not Urgent) in the Seven Habits of Highly Effective People. Quadrant 2 includes maintenance, advance planning, being prepared. Preventing problems, or dealing with them to minimize their impact is important. I could never call it wasteful. In fact, I see attention to Quadrant 2 as a sign of good leadership, good farming. We need to make time for the important tasks that are not yet urgent. Scout for pests, don’t ignore them till they overwhelm your crops. In this second book there is acknowledgement that while muda is usually translated as waste, not all muda should be completely eliminated. Simply minimize the time and energy given to non-value-adding activities. OK, I can go with that. In fact, the list of 10 forms of muda doesn’t say a word about managerial activities. Or about reading books, or writing reviews! 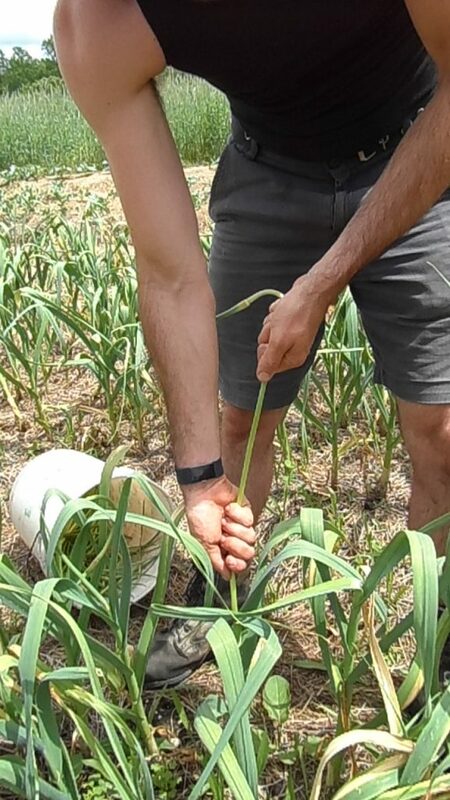 Ben takes a Lean look at crop planning, bed prep, compost-making, seed starting, transplanting, the Japanese paper pot transplanter, direct seeding, weed and pest control, sales, seven crop case studies, greenhouses, and finding good land and building a farm. There are valuable appendices with recommendations on tools, crop varieties, dollar-value-per-bed, a photo gallery of seven more crops, a Japanese glossary, and a book list. I’m a fan of careful crop planning, and I acknowledge that doing it efficiently is important. There is definitely such a thing as “over-planning.” I think experience teaches us what we need planned and what we don’t. 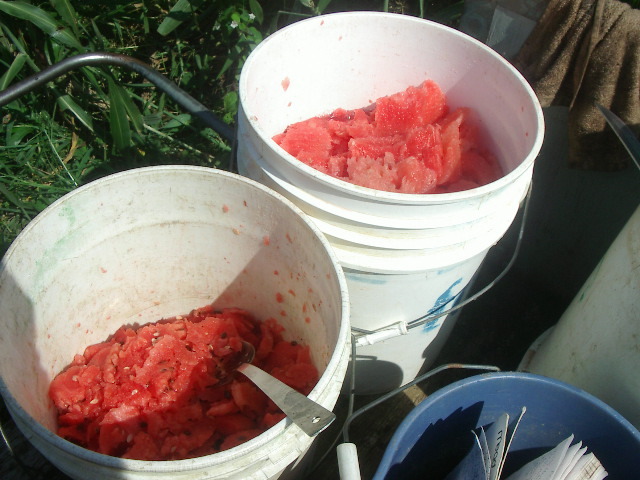 When the same people grow the same crops on the same farm year after year, lots can be taken as decided. When we have built fertile soil and there are no new plagues, we can get away with minimal crop rotation. 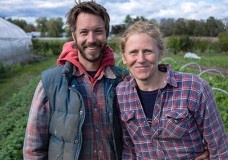 At Clay Bottom Farm (in Indiana), Ben, Rachel and their crew are earning their living from less than one acre, growing and selling specialty produce to restaurants, farmers markets, and through their CSA. They grow a lot of salad greens and tomatoes, along with some root crops, peppers and eggplants, zucchini and cucumbers. Sweet corn, beans, peas, winter storage crops don’t feature much or at all. They have found the crop mix that works for their customers (that is one of the 5 Lean Principles). The situation in our gardens seems more complicated, but the point remains: streamline the planning, don’t over-work it. The concept of load-levelling (heijunka) is valuable – look at the plan for the year and keep it manageable every month. And plan in a vacation for everyone. We try to stagger our vacations so that there are always a few people who can run things, taking turns. We tried reducing the August workload, moving one big task to September, and taking a few weeks off from lettuce production. 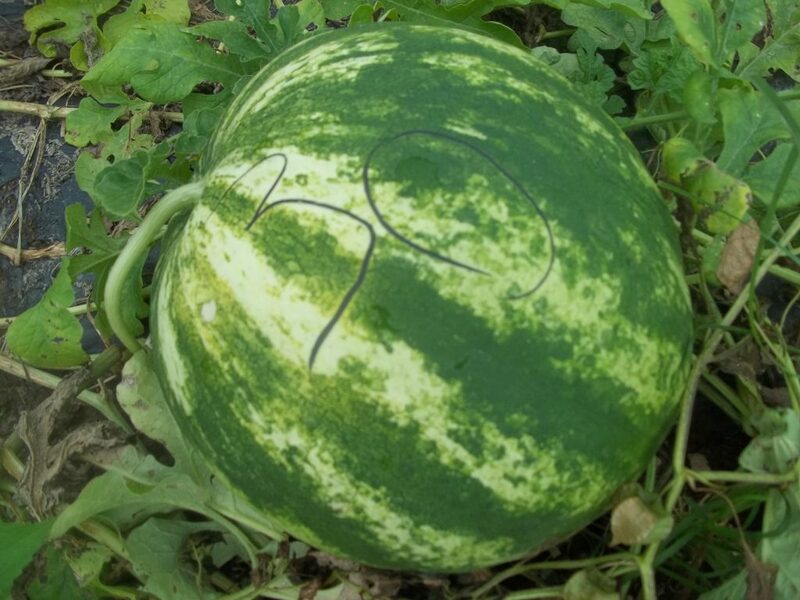 Ending our watermelon harvests at the end of August and our winter squash at the end of September were helpful in keeping fall work manageable. We’ve got better at “doing-in” plantings of beans, cucumbers and summer squash if they are getting to be oppressive. I was particularly excited to see instructions to build a seed germination cabinet à la Hartman. Like Ben, we use discarded refrigerators. Ours rely on incandescent light bulbs, which are a dwindling “resource”. Some would say “good riddance” but we are actually using the heat the bulbs generate, as well as the light. Ben’s clever design uses a pan of water heated by an electric element, on a thermostat. This could be our next germinator! 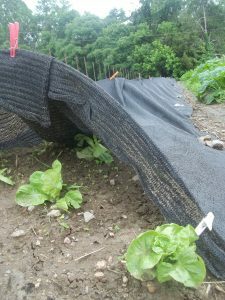 I’ve read about the Japanese paper pot transplanter before, and concluded it’s best for plants set out at 6″ spacing or less, and fairly large plantings of one thing. I’m intrigued – would love to try it, even though we do more direct sowing of close-planted crops than Ben does. I love the idea of a carefully-designed manual machine for transplanting, especially as my knees get older, and like squatting less. This chapter is worth the price of the book to anyone about to buy the transplanter. So many tips, including Ben’s Paper Pot Cheat Sheet. The direct-seeding chapter explains the Jang JP-1 seeder, and the same message applies about buying the book if you’re buying the seeder. Weeds and pest control without muda – Yes, of course, focus on prevention, rather than managing. Ben gives 5 Steps to No Weeds. Yes, time saved there would pay for the price of the book too! Pests, Leaned Up is about Biological IPM: rowcovers, beneficial insects and biological sprays if needed. The sales chapter looks at transportation logistics, sensible delivery vehicles. As Ben says, “Big vehicles, we learned, don’t by themselves lead to large sales”. Avoid over-production. Set up your market booth for smooth flow. The case studies explore how Clay Bottom farmers decide which varieties to grow, where and when, and of course, how much. The case study crops are tomatoes, baby greens, kale, head lettuce and romaine, carrots, other bunched roots, and peppers. Here’s good information from someone who has paid exquisitely good attention to what works and what doesn’t. 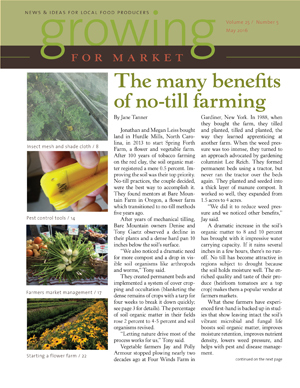 The chapters on finding good land and setting up your farm in a well-organized, Lean, way will save new farmers some costly (livelihood-threatening) mistakes, and help the rest of us think twice about why we store our tools where we do, and so on. The greenhouse chapter is brief, and yet full of gems about design. Holiday Season approaches, I’m just sayin’. 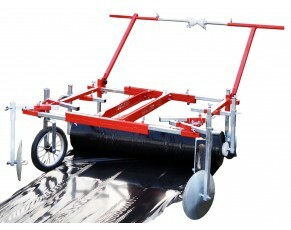 Or invest in your farm, with this worthwhile business expense. In other words, buy this book! Photo from Les Jardins de la Grelinette in Saint-Armand, Quebec, Canada. 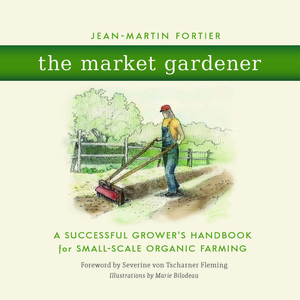 The Market Gardener’s Toolkit by Jean-Martin Fortier is now available for sale online on DVD or Digital Download. $25.49 and $15.49 respectively. Worth every penny! It’s 80 minutes of very inspiring and immediately useful information on small scale sustainable vegetable growing. The Market Gardener’s Toolkit is an educational documentary featuring Jean-Martin Fortier, small-scale vegetable grower and author of the bestselling book The Market Gardener. 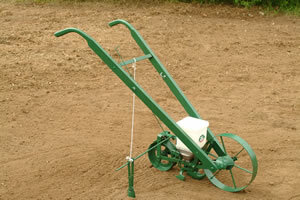 In the film, he shares his tools and techniques for successful, profitable, human-scale vegetable growing. 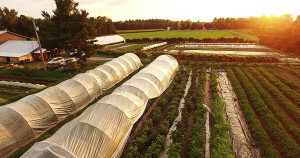 From soil preparation to strategies on dealing with insect pests, discover how this micro-farm manages to generate $150,000 in sales annually – without the use of a tractor or any heavy machinery. There is also a teaser or two on YouTube here and here. I participated in the crowd-funding effort to help get this video made, and so I am now the happy owner of a digital download. I’ve watched it once, and am now organizing a group showing for our crew and neighboring gardeners. I loved every precious minute of this video. It made me proud to be a vegetable grower, using sustainable techniques, contributing to a healthy local food supply. It made me inspired to try harder to use more effective and efficient methods. The aerial views and plan of their plots and crop rotation are inspiring and beautiful. It was valuable to see tools in action, such as the broadfork, the five row flamer, the Terrateck manual mulch layer and the home-made precision vacuum seeder. It was helpful (and fun!) to see the speeded-up version of the farmers moving the large sheets of “occultation plastic” (poly silage covers) used for weed control. It was encouraging to be reminded (after too many years of battling weedy gardens) that clean productive gardens are possible and, indeed, wise. They are more productive, more satisfying, more profitable, with less wasted time. I get it that hand-pulling weeds is more like first aid for a garden gone sadly wrong. I know it’s better to hoe when weeds are tiny, to flame and to prevent weeds from coming up in the first place. We’ve been doing better this year on preparing “stale seed beds” by tilling and prepping the bed at least week before we need it, then scuffle-hoeing on the day before planting. This one change is really making a noticeable difference in our gardens. Last winter I had been thinking we needed to get a cultivating tractor, and to re-arrange our garden plots for tractor access and accept the turnaround space lost to crops that tractors require. And accept the increased use of fossil fuels, and time spent fixing machines. Watching The Market Gardener’s Toolkit instead reaffirmed the high value of intensive use of garden soils and smart manual work. This fits with the series of books I’ve been reading recently: Ben Hartman’s The Lean Farm, Curtis Stone’s Urban Farmer, Colin McCrate and Brad Halm’s High-Yield Vegetable Gardening, and of course Jean-Martin Fortier’s Market Gardener and Eliot Coleman’s work. 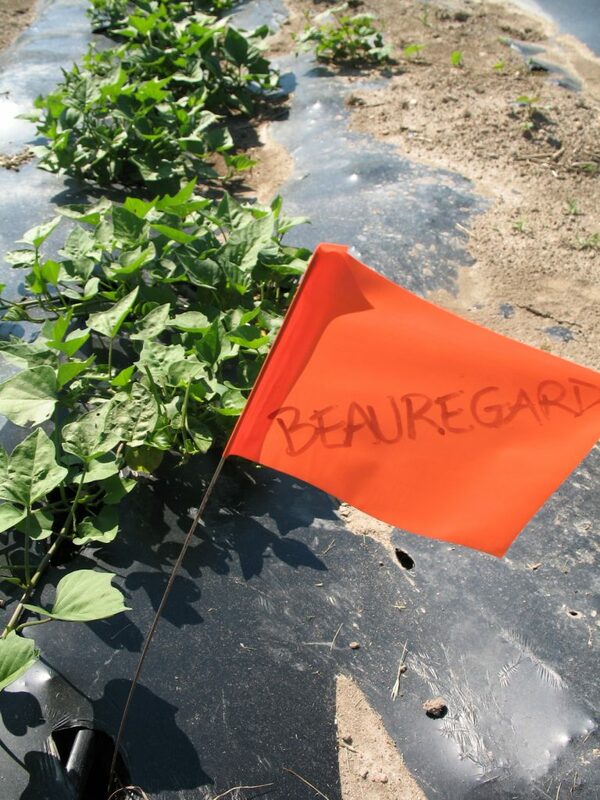 Beauregard sweet potatoes on biodegradable plastic mulch. Jean-Martin Fortier also has a series of 13 YouTubes. 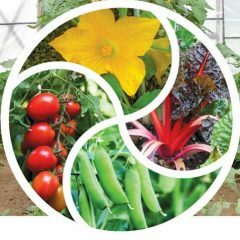 The Market Gardener, Six Figure Farming, Living Web Farms: Part 1, Introduction and Part 2, Getting Started and more: Bio-Intensive Farming, Cropping Systems, Compost Strategies, Soil Management, Cover Crops, Seeders, Weed Prevention, Seedlings & Transplants, Crop Planning, Insect Control, Market & CSA . You may remember I reviewed Jean-Martin’s Book The Market Gardener. 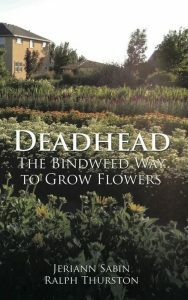 His book has sold over 80,000 copies, and is the winner of the American Horticultural Society 2015 Book Award and the Living Now 2015 Book Award. You can buy the book on his website. 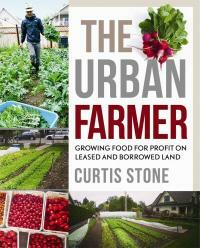 Curtis Stone wrote this valuable book after only about 6 years as owner/operator of Green City Acres, a small commercial vegetable farm in Kelowna, British Columbia, Canada. He supplies fairly high-end restaurants with leafy greens and a few other carefully chosen crops which bring a fast return. He also sells at a farmers market once a week. 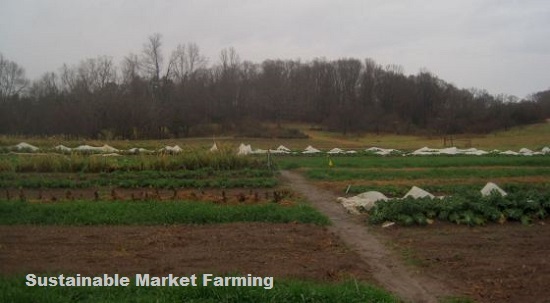 Curtis has figured out how to make the best farming use of small plots of urban land, and in the same way, he has figured out how to make best use of his time, so that he can earn a good 5-figure income from his one-third acre farm. He pays exquisite attention to what works and what doesn’t. Oh, and most of his transportation is by (electrically assisted) bicycle. This book is part of the recent movement to make a good living as a farmer on a small area of land, without big machinery, as exemplified by Eliot Coleman, Jean-Martin Fortier and Ben Hartman (and as Colin McCrate and Brad Halm do for home gardeners). 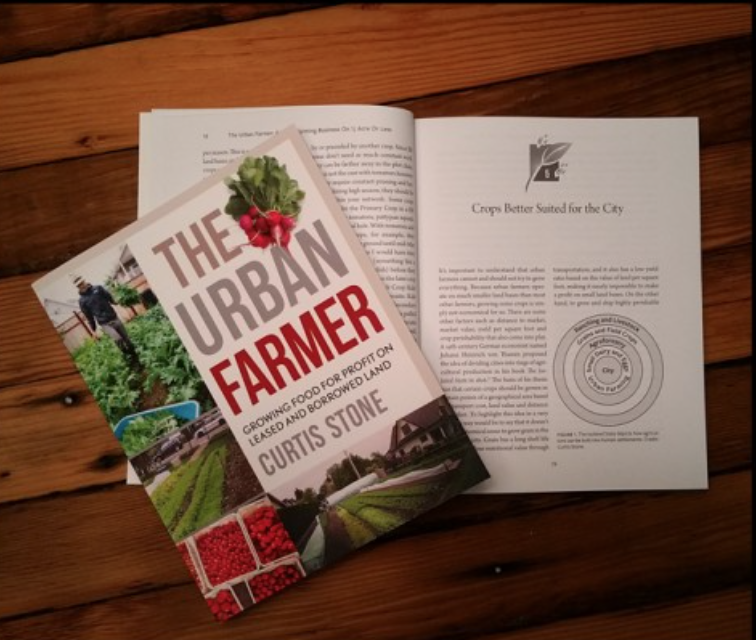 Curtis writes as an independently-minded entrepreneur engaged in sustainable agriculture, in being part of a better future, supplying very fresh produce to city-dwellers. 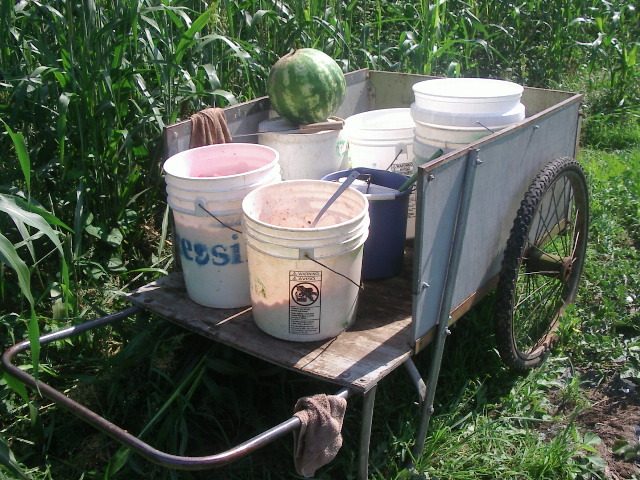 He shows how would-be farmers with no capital, no land and no truck can get a start. This book will quickly earn its keep. If Curtis Stone is speaking at an event near you, be sure to go to it! This is a very well-organized and well-written book. The language is clear and straight-forward. The short sentences are made for high-lighting! No skirting of sub-clauses is required. The 41 chapters divide into ten sections. Some chapters are very short. Curtis is not going to waste time filling blank space when he can explain the important stuff in a paragraph. He covers the why and where, and the business aspects, then finding and developing various plots of land into a cohesive small farm. He advises on infrastructure, equipment, production, harvest and post-harvest systems. He also covers basic crop planning. This isn’t a book about growing a complete diet, or supplying a full range of vegetables for a CSA. Nor is it about how to grow carrots. There are 25 pages devoted to cameos of twenty recommended crops, but if you are a new grower, you’ll need more production info than you find here. Production is one of the main focuses (along with planning and organization) of my book Sustainable Market Farming. Instead, this book can inspire and educate on how to make decisions likely to lead to successful sales, while focusing your hard work on the tasks that will get you there. 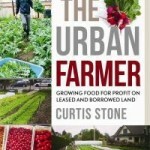 If you want to do multi-site urban farming to grow selected crops for restaurants in the Pacific North West or British Columbia in zone 7a, this book has most of what you need. But its usefulness isn’t at all confined to people in those regions, or to urban farmers, or to super-fit cyclists. So if your town already has a restaurant supplier of bio-intensively-grown salad crops and greens, do not despair. All vegetable growers can find something of value in this book, whether it is in his analysis of different crop types, growing microgreens, becoming more efficient, choosing good tools or keeping good records. Curtis is a believer in farming smarter, not harder (but hard enough to make it all work). He puts the work in, in a timely way, is very observant, keeps good records, analyses his results and makes changes based on what his records show. He’s not one to grow red peppers “because everyone wants them.” If we follow our hearts only and ignore our sales figures and production costs, we won’t last long earning a living as farmers. Likewise, it’s good to have ethics and ideology, but if you go broke, you’ll be out of a job. If ten crops bring in 80% of the income, why not focus on those? After his first four years, Curtis reduced his farm from 2½ acres to 1/3 acre (5 plots close to each other). 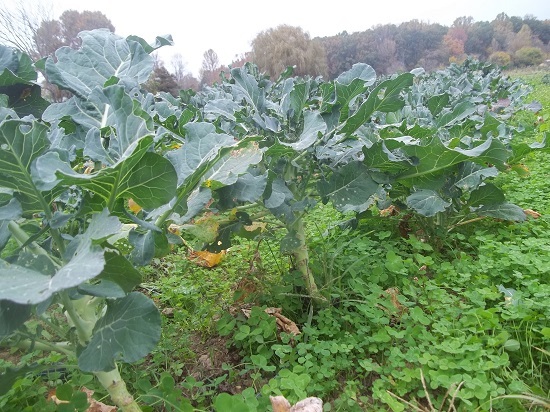 He cut his crop portfolio down to the most lucrative fifteen vegetable crops; he parted ways with his fellow worker, his CSA and most of his employees. His hours went down from 100 per week to 40 (and fewer of those were spent managing other people, more in planting and harvesting). 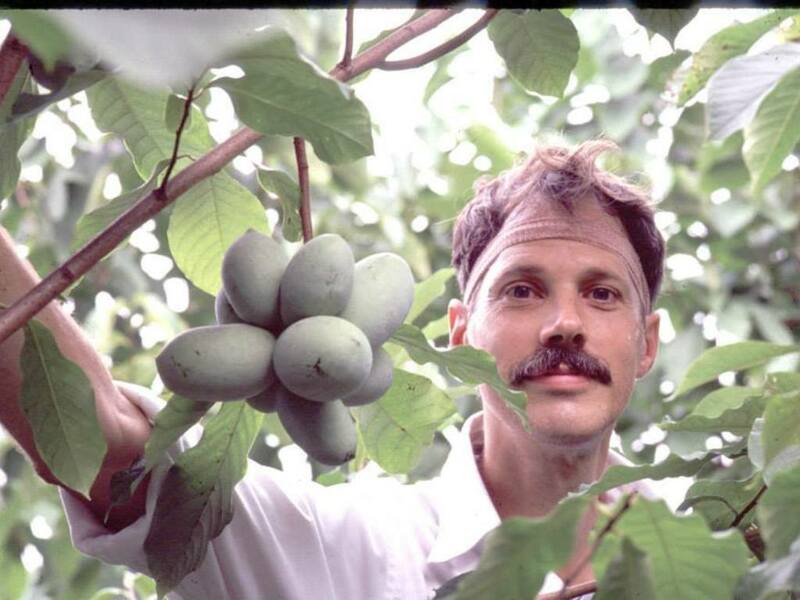 His clients were mostly restaurant chefs and his weekly farmers market. He had his best season that far, making a much higher dollar per hour. Curtis is willing to change plans for a better idea, or to transform a crop failure or over-abundance into a baby beet greens opportunity. He sees the coming end of suburbia as a great opportunity to reclaim all those lawns for food growing: modern-day self-reliant farming communities. 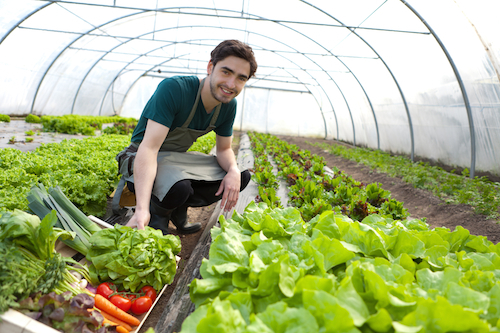 Being an urban farmer means interacting with lots of people every day, which leads to opportunities to educate about food, to be part of the local community, and to benefit from what local people will offer in terms of land, help and free advertising. 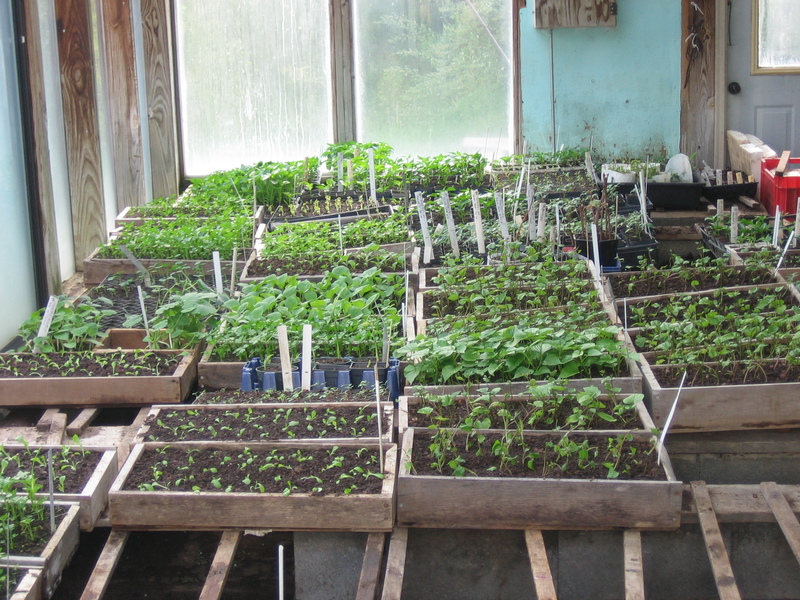 Quick Crops (maturing in 60 days or less) mostly grown in Hi-Rotation plots: mostly salad greens and radishes. 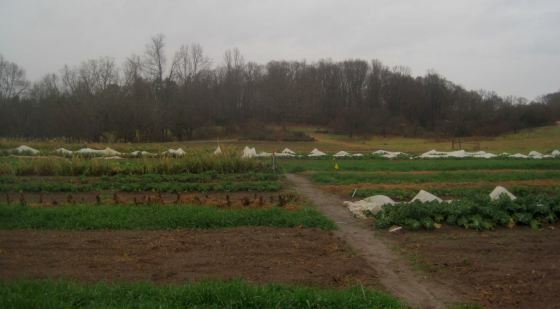 The Hi-Rotation beds might grow 4 crops in a single year, with no pre-planned crop rotation. Sometimes a Steady Crop like carrots is grown in a Hi-Rotation plot. Steady Crops (slower maturing, perhaps harvested continuously over a period of time): kale. tomatoes, carrots. These beds will be in a Bi-Rotation plot, which often will grow one Steady Crop as the Primary Crop, followed or preceded by a Quick Crop, especially one that can be cropped out at a single site visit, rather than requiring daily harvests. It works best to have the Hi-Rotation plots nearest to the home base as they need the most frequent attention. Bi-Rotation plots can usually be further afield, except for indeterminate tomatoes which Curtis grows on a close spacing and prunes hard to improve airflow and encourage early ripening. Slow long season crops aren’t included, nor are ones that take a lot of space, like sweet corn. Popularity (matched with low market saturation). To use this assessment, give each potential crop a point for each factor where it deserves one. Then look for the crops with the highest number of points. Spinach gets all 5 points; cherry tomatoes only 3. 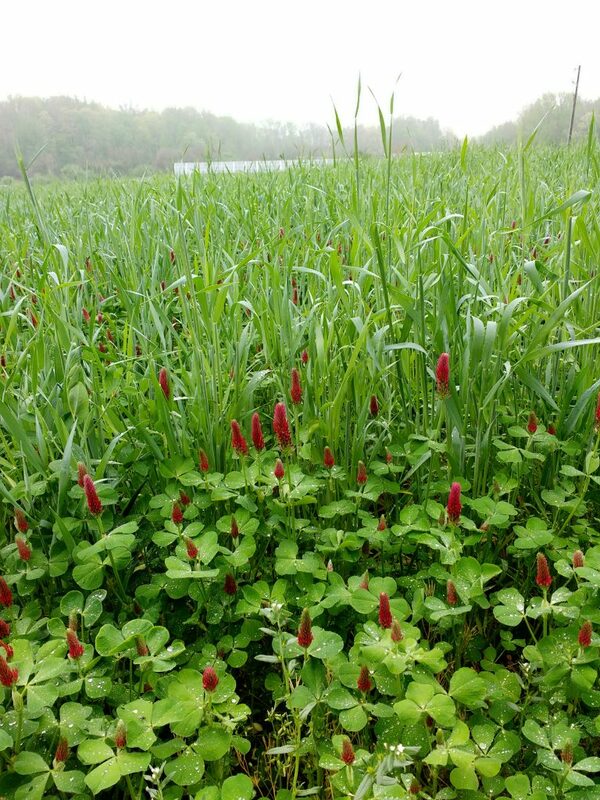 The smaller your farm, the higher the crops need to score to get chosen. 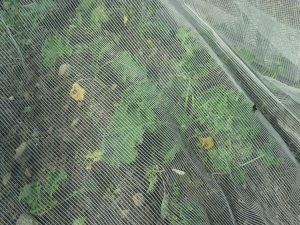 Winter crops can be grown in hoophouses (polytunnels). 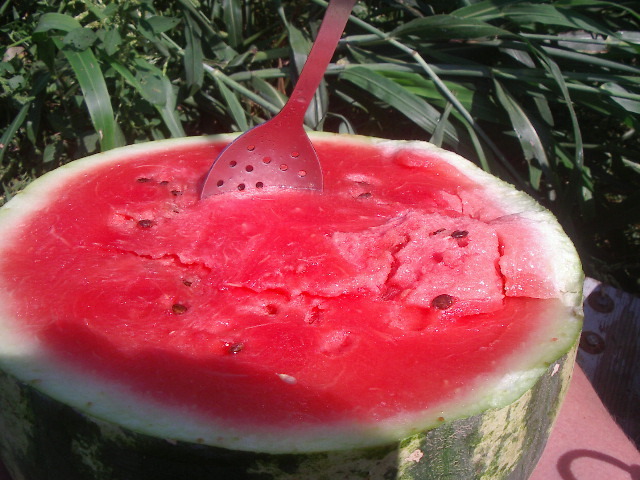 Summer crops can help level the weekly sales out over the market season. Various start-up models are spelled out, along with the caution to start small, say with ¼ acre, and low overhead expenses. Various market options are compared. The section on software and organization lists the ten spreadsheets Curtis prepares: Plantings, Yields, Crop Profiles, Weekly Orders, Weekly Sales Totals, Land Allocation Data, Budget and Expenses, Seed Order and Inventory, Plot Progress, and Spoilage. There is a section on scouting for land and how to choose the best of your offers, and which to decline (heavy metal soil contamination, neighbors spraying herbicides, Field Bindweed, too much shade, too many rocks, owners needing too much care-taking. On the other hand, don’t be over nervous about invasive grasses, they can be conquered. There is information you won’t find in many other farming or gardening books, such as how to remove sod. There is a thorough section on irrigation, set up for low management with timers and many sprinklers covering an area, or many lines of drip tape. I learned for the first time about flow through drip systems, where both ends of each drip tape are connected into the mains tubing, so that water can flow in both direction, and blockages will not be a problem. The costs are all spelled out (so get the book and buy the gear before prices go up!). 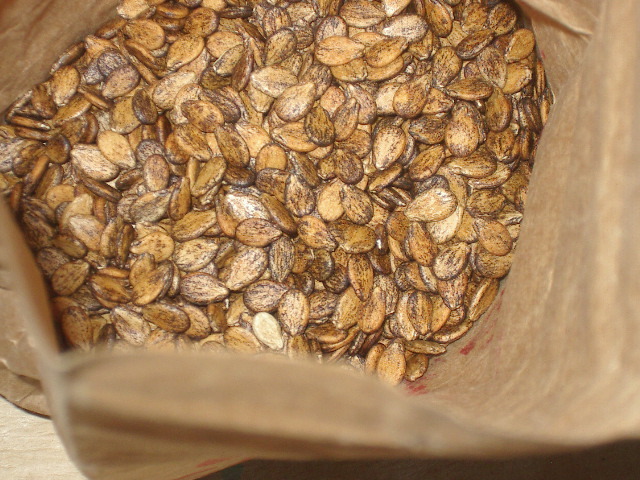 Every section contains a gem that will save you time, money, mental strain or wasted crops. It hadn’t occurred to me that box fans could be laid flat above vegetable drying racks to dry washed greens and preserve the quality. All of the equipment Curtis puts together is inexpensive and relatively easy to move to a new site. Two medium size coolers instead of one big one! Standard lengths of rowcover! Little decisions can have big benefits. Microgreens production indoors (in shallow flats) and outdoors (much less usual, but oh, the returns!) Curtis explains his special board technique for getting fast even germination. 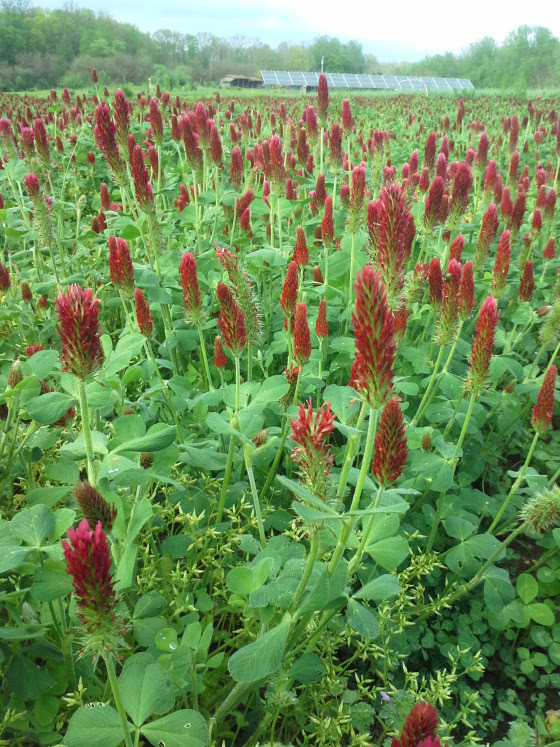 The crops section focuses on providing the basic information through the perspective of factors already mentioned: Quick Crop or Steady Crop, months of harvest, Crop value rating, Days to maturity of recommended varieties, Yield per bed, Gross profit per bed, and also Planting Specs. Here is a great book for those who want to make their farming time count and be as productive as possible, with best value for time and the land available. Also go to the book website to buy digital tools, and sign up for Instagram, Twitter and link to YouTube videos. At the Green City Acres website you can sign up for their newsletter. For the Mother Earth News Fair in Asheville, NC this past weekend, I updated and presented my Fall Vegetable Production slideshow. Here it is from Slideshare.net, including some bonus material I didn’t have time to present at the weekend. The other slideshows which I have embedded in blogposts previously can be found by clicking the Slide Shows category in the list of categories to the left side of the page. This includes Crop Planning. The Fair was a big success, despite challenging windy cold weather on Saturday. it takes more than that to deter the Mother Earth audience of gardeners, farmers, ranchers and homesteaders. The big tents all stood up to the weather. My 4 pm workshop was in one of the tents, and I wore many layers of clothes, including my jacket and woolly hat! 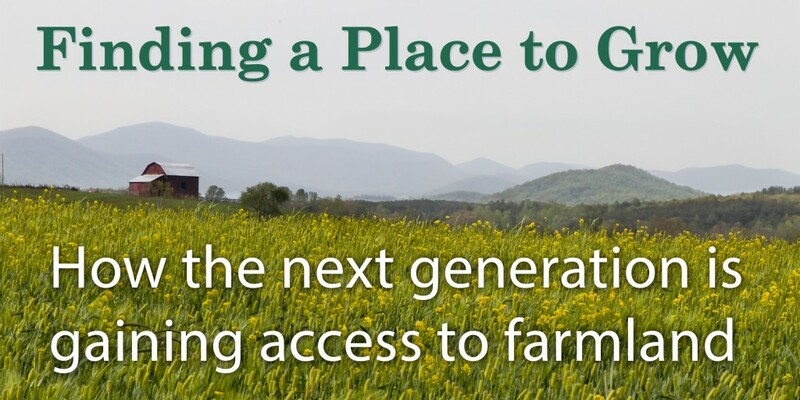 I went to some great workshops, including ones by Eliot Coleman, Jean-Martin Fortier, Curtis Stone from the west coast of Canada (I’ll be reviewing his book The Urban Farmer, in the next week or few), and Matt Coffay from Second Spring Market Garden in Asheville, North Carolina. The theme common to all these growers is producing wholesome fresh sustainably grown vegetables using manual tools and efficient techniques. My quest also! 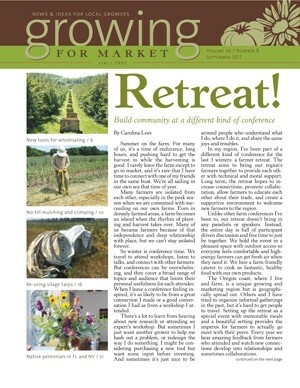 The April issue of Growing for Market magazine is out. The new editor is having the high-level problem of an over-abundance of good articles, and I didn’t manage to get one in this issue. 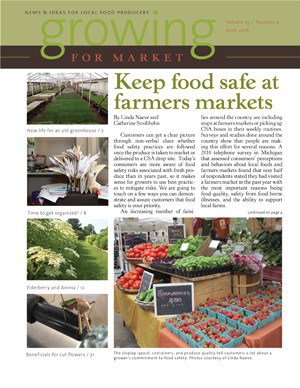 You can read about ensuring food safety with your produce, in an article by Linda Naeve and Catherine Strohbehn; and one on refurbishing an abandoned edge-of-town garden center and converting it into a collaborative venture of several farmers growing microgreens and vegetable seedlings, by Lynn Byczynski ( the “retired” editor), who also plans to move her family’s seed business there. Paula Lee writes about having and maintaining an orderly farm office; Abbie Sewall discusses growing elderberries and aronia berries (and using bird netting very like our newer blueberry netting which I wrote about in May 2013); and lastly Gretel Adams on pest control in greenhouse flowers. Five great articles in 24 pages! 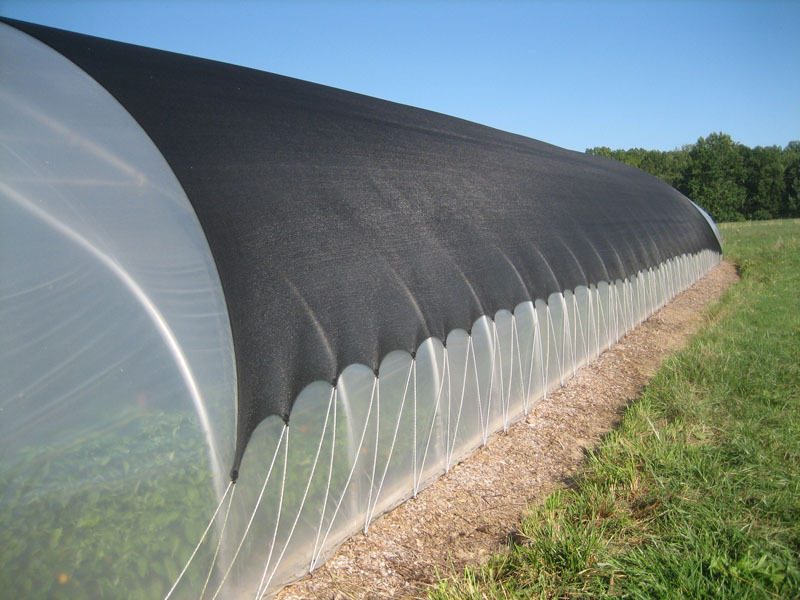 Our blueberry netting on PVC electrical conduit hoops. Next week I’ll tell you more about recent work in our gardens. 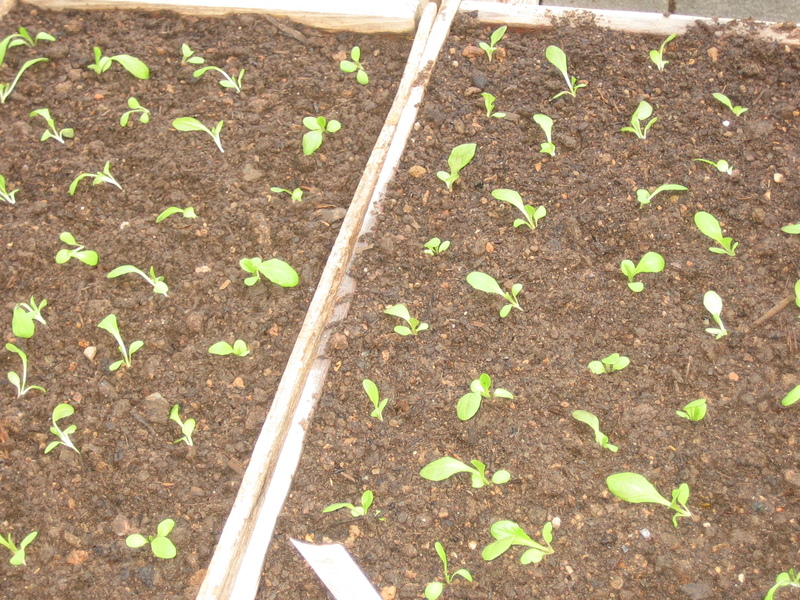 It’s been a bit depressing this week, with broccoli transplants dying on that very cold night last Saturday. But carrots have germinated, rhubarb is almost ready to harvest and the hoophouse tomatoes are looking particularly good!